Our man in Greenwich, Craig Fehrman, describes what it was like to wait for LeBron's Decision under a tree in a tony Connecticut town for hours with hordes of media and curious onlookers. GREENWICH, Conn. — The New York Times, the New York Daily News, the Hartford Courant, the Greenwich Times, and the Associated Press, along with innumerable TV outfits, coronated 15-year-old Mike Correa as "perhaps the first fan" to stake out the site of LeBron's televisual denouement. Apparently, Correa arrived at the Greenwich Boys & Girls Club at 9 a.m. When I got there at around 2:15 p.m., I saw Correa, a parental-looking figure who kept spelling out the kid's last name like a pro, and a group of photographers and cameramen. No wonder they went with "perhaps the first" — that's much kinder than "perhaps the only." You don't need me to tell you that The Decision was an overcooked media fiasco. (One relevant instance: Even as our best and brightest were explicating LeBron's choice of Greenwich, no one pointed out that there are only two Clubs between New York and Bristol — and you know ESPN wasn't doing this in Stamford.) But it may be instructive to enumerate how redundant the coverage was, how happily the crowd played along, and how severely both groups got screwed, thanks to ESPN's iron fist. Let's start with some topography. Greenwich, not surprisingly, offers a pretty unique take on the Boys & Girls Club — a colonial-style clubhouse that opened in 1939 and sits a couple of blocks from a car dealer specializing in Rolls Royces and, for the local sports fan, the Rink and Racquet, Ltd. 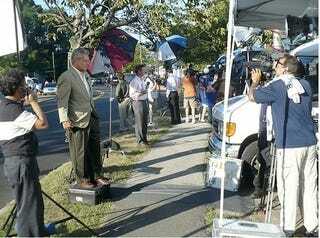 The Club faces Horseneck Lane, and, since only ESPN personnel were allowed on the Club's side of the road, the rest of the media set up camp in a commuter parking lot directly across from it. On the lot's left side, Shore Drive intersects Horseneck, and this created the second holding pen where Mike Correa and the other fans bellied up to Horseneck. At 2:15 on Thursday, though, this is still pure potential. Other than the folks documenting Correa, the media sit inside their fleet of idling, air-conditioned vehicles. The whole place reeks, not of disloyalty or defeat, but of CO2. Most of those vehicles belong to local stations, but it's clear that this has become a national media event. For several crews, it's their first time in Connecticut since the Annie Le case. Even though the Greenwich location didn't leak until yesterday — a fu-manchued cop tells me they didn't even hear about this until then — the media started arriving late last night. Most of them still have no idea why they're here, and in such force. The leading theory holds that viewers have been pressuring the networks — too much oil spill, too much war. But even the busiest crews broadcast only once every four or five hours. The crews eat, catch up with industry acquaintances, take multiple naps. The anchors disappear for so long that you forget they exist. They pop out a minute or two before going on air, apply a moist towelette, and intone for 30 or 45 seconds. I end up spending most of my time with three catatonically bored people from a national finance network. They got here at 7 a.m., but, since they didn't bring along any on-air talent, their only job is to get some b-roll and the crucial shot of Lebron entering the Club. This same network has also stationed crews outside Allan Houston's house and at the airport, and this kind of vigilance is happening all over the place. At around 4 p.m., a few fans, mostly young, mostly male, start showing up, and the media heads over to get some color. Most outlets seem to practice a form of jersey-based affirmative action. One reporter holds a screen-printed sign that reads: "ANY FANS FROM: BRONX or BROOKLYN or LONG ISLAND." Everyone asks the same two questions: "Where do you think he'll go?" and "Will you still be a LeBron fan?" The crowd remains more than half media types, but this works out just fine since it's such a media-savvy crowd. One guy, who looks to be about two years from pledging some horrific frat, gives at least a dozen different interviews. Instinctively, the fans squeeze in for crowd shots, screaming and waving signs at the cameraman's signal, then pivoting a few degrees to do it all again. By the time the 6 o'clock news rolls around, I count 14 traditional local news vans, plus at least that many unmarked SUVs paired with smaller digital set ups, plus 5 satellite uplink trucks, plus a couple of cable networks and a couple of broadcast networks. Almost every team has multiple vehicles. None of this includes any ESPN stuff. There's an eerie synchronization to the actual broadcasts, as seven or eight local sports guys spread out along Horseneck Lane. They all say the same things, then all turn to the fans they've ferried over from the other side of Shore Drive. But the weirdest thing about all this is how little the media know about what happens next. I'm not talking about where LeBron will sign — no one out here knows when LeBron's arriving, what direction he's coming from, what car he'll be in, even whether he'll be using the Club's front or side entrance. By 8 p.m., the crowd's started to thicken up and diversify. Kids start climbing up trees. Ned Lamont supporters pass out stickers; elsewhere, some Mormons push a more permanent message. One Gossip Girl extra walks by and says to her phone: "Lebrons Jame is in Greenwich! Get down here!" She then turns to her friend: "Is Jay-Z coming?" Some families also show up, along with plenty of NBA fans. I start to hear a few "NEW YORK KNICKS" chants. For the most part, though, it all feels oddly hushed and anticipatory. At around 8:30 p.m., and for no discernible reason, everyone charges over to Horseneck's Club side. The cops herd us back, but 10 minutes later it happens again. The cops start lowering their expectations; a persistent soul on the P.A. keeps telling everyone: "Stay on the sidewalk. Look at your feet — does that look like the sidewalk?" You'd think these maneuvers would be keyed to a LeBron sighting or even a crowd disturbance, but they aren't. Everyone on the ground is as confused as the media. It's now dark enough that we can see into the Club's gym, with its TV backdrop and decorative kids. But the crowd, continuing in its role as the world's best studio audience, makes it impossible to know what's going on. Each burst of cheering turns out to be the result of a camera needing a live look-in. The fact that Greenwich's regular traffic flow includes so many unbroken chains of swank SUVs doesn't help. And that's how it ends: those of us standing 75 feet from LeBron become the least informed people on the planet. A lot of folks still think LeBron hasn't even arrived when the P.A. cop finally tells us the outcome. "It's the Miami Heat, folks. Now stay on the sidewalk"
At 9:15 p.m., I cross Horseneck Lane one last time and talk to some very sullen cameramen. The crew from the finance network got word from their airport compatriots that LeBron was on the move. They shouldered on their cameras while the guys at a New York affiliate were still breaking down the latest batch of interns, but it didn't matter. No one seems to have any usable footage. Lebron ended up skipping the front and the side entrance in favor of an undiscovered side-to-back entrance largely obscured by trees. A full ESPN crew was there to greet him, but no other cameras got the shot of him leaving the car. One network guy tells me he got "a second of him, maybe. If someone else got it — and I don't know how — it'll be worth a lot of money." Right about then, the crowd learns of LeBron's decision. All around and all at once, the boos rain down. They last the length of your average news segment, after which most of the people leave quickly. Those who stay couple up with TV cameras, radio reporters, print guys with notebooks, and the show goes on.